Dobermans are famous for their playful natures, and most love toys. However, some toys are just not up to their demands, and if Doberman pet parents don't shop carefully for toys they often find that their Dobie has destroyed their brand new toy in hours - even minutes in some cases. That means that dog toys for Dobermans need to be durable. But which of the many offerings out there can stand up to a Doberman's demands? Here's a look at seven of the best. Always supervise your Doberman when he gets a new toy. Not all dog toys are just for fun, some actually help improve the quality of your pup's life (as well as your own) and the Bob-a- Lot is designed to be one of them. Two problems that many Doberman pet parents struggle with are a) their pup eating too fast at mealtimes, or gobbling up their treats too fast and/or b) destructive behavior when left alone. Why the latter is bad is fairly obvious - no one likes to come home to a mess - but many pet parents don't always understand why eating too fast is a bad idea too. Eating too fast can not only be a choking hazard but the excess air that it adds to your pet's stomach can lead to a serious condition called Gastric Dilatation-Volvulus. And GDV or "bloat" is life threatening. The Bob- a-Lot is actually an interactive feeder, rather than just simply a toy. It can be found in two sizes - with the larger being best suited for Dobermans - and looks a lot like a larger version of the 'Weeble' toys you yourself might have played with as a kid. It wobbles in the same way - remember "weebles wobble but they don't fall down?" - and that movement alone is enough to fascinate most dogs. Adding treats enhances the game, as then your Dobie has to work out which way to push his new pal in order for the treats he (obviously) wants to be dispensed. This is not only entertaining and engaging for them but can help solve the two problems we just mentioned. Fast eaters will now take longer to finish their rations and as destructive behavior when left alone is usually due to boredom and anxiety leaving your Doberman with a toy like the Bob-a- Lot, which will distract and entertain them, can be a big help too. But how durable is it? 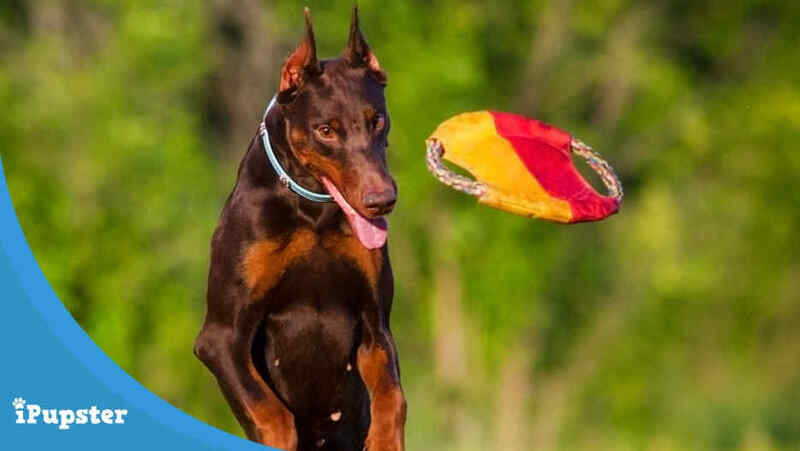 According to the reviews submitted by pet parents who have tested it out if it is used in the right way it stands up to a Doberman very well. It's rigid plastic construction can take a lot of knocks and as it is not a chew toy if your pup is shown how to use it properly - as the directions advise - that should not be a problem either. This toy gets rave reviews from Doberman pet parents for its entertainment value - for both their pup and themselves as it is fun to watch them figure things out - and top marks for durability, making it an all-around great buy. Most Dobermans love to chew. But as we mentioned earlier, lots of chew toys are not up to the task, and an eager Doberman can destroy them very quickly, which is not only bad for your budget and very messy - not to mention sad for your excited pup - but could pose a choking hazard as well. So, having established that Dobies need a very durable chew toy the good news is that the KONG Tire Extreme dog toy fits the bill very nicely. It really does tick all of the right boxes - it's shape - tire shaped - is easy for Dobermans to get to grips with, its construction is very solid and, when purchased in the largest size it is sized perfectly for larger dogs like them. What surprises many is that as tough as this dog toy is - and many of those who have purchased it attest to the fact that it is - it also has a nice bounce to it - just like a real tire - making it suitable for use in a fun game of fetch as well as for serious chewing. 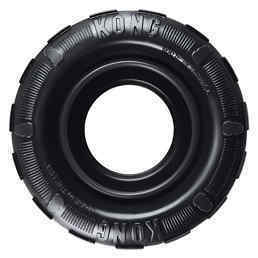 The Kong Tires Dog Toy is a rare chew toy that is almost universally praised by purchasers in terms of its durability. Many Doberman pet parents comment that they have bought other dog toys 'labelled indestructible' that their lively pups have chewed through in just a few days, but that is not the case for this tough tire. Most also like the versatility, in that it can be used as a solo chew toy by the pup alone or as part of an interactive game with their pet parent. Most dobermans love to run, and most love to play with a good ball too. The problem is, that given that Dobermans can be very excitable, and they love to chew (hard) often a standard ball just does not make it through one play session. Which is sad, as given have a chance most Dobies love to show off their 'soccer skills'. 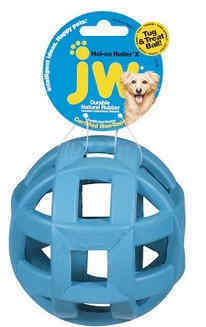 The Jolly Push-N-Play is a ball that works brilliantly for Dobies. It's big - 14 inches in circumference, it's tough and it's designed to be pushed, prodded and kicked to their heart's content. Even better this is a waterproof toy, so it's great for pool or lake playtime as well. And unlike many standard balls chewing it to bits is something that your Dobie should find much harder to do as it is made from a rigid plastic that it's hard for canine teeth to even scratch. Those who have purchased this colorful, durable ball praise it for its durability, reporting in some cases that their pup has 'owned' the ball for several years. 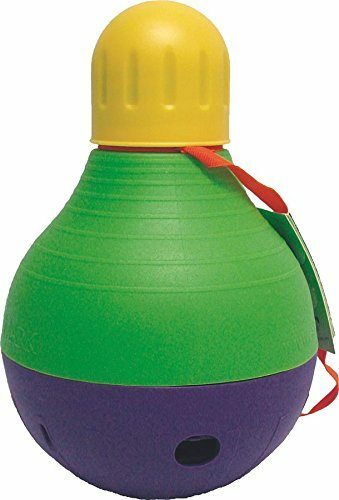 Reviewers also enjoy its versatility, with many commenting that it is the perfect toy for beach trips, as it can be used for soccer 'games' in the sand or for fun waterplay. 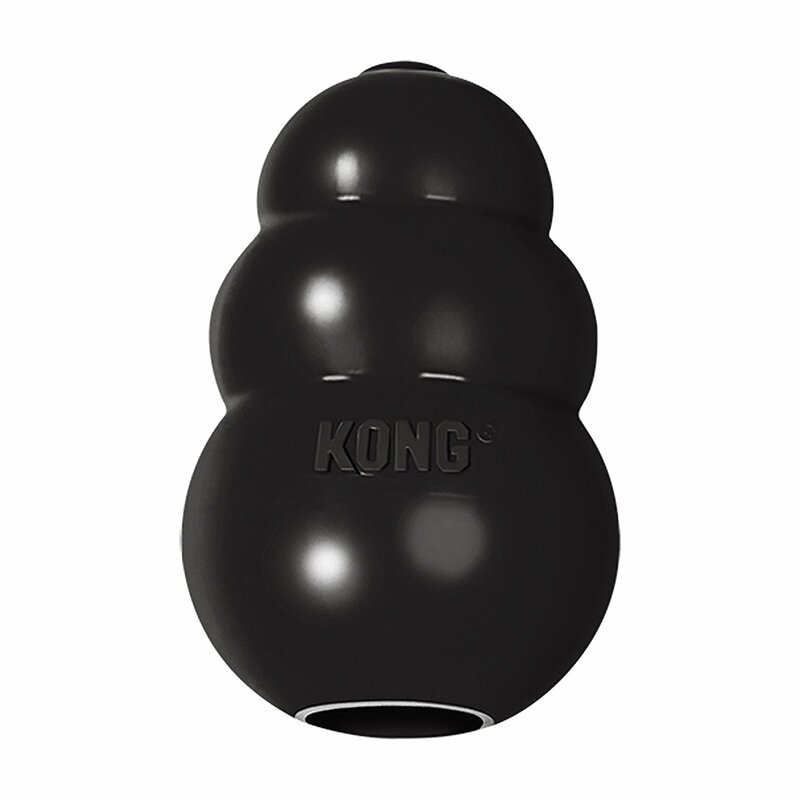 The Kong Wobbler Extreme is another durable dog toy that is designed to stimulate a dog's intellect and provide him with a challenge, the possibility of a treat and lots of good chewing time. The toy comes in several different sizes and it's advised that you make your choice based on your pet's weight (there is a handy, easy to read chart included on most online retail sites). Whatever option you do go for however you will get a hard plastic 'wobbler' that can be filled with small treats or with peanut butter or 'doggy' ice cream. To help the latter last longer the toy can be safely frozen. In addition to figuring out how to release his treats from the toy your pup can also chew to his heart's content. Many of those who have purchased and reviewed it praise its durability even when faced with the most aggressive chewer and are impressed by just how long it can keep their pup engaged and amused. Not every pup likes the feel of hard plastic in his mouth, some prefer the flexibility and softer feel of rubber. The problem with that when it comes to aggressive chewers like Doberman is that most rubber dog toys just cannot withstand that kind of 'punishment' and only last a few days. The Hol-ee Roller X Extreme is crafted from a far more durable rubber than most other toys - one reviewer notes that her pup's even withstood a lawnmower blade - and so, as most purchasers note, it can be aggressively chewed repeatedly and still 'survive'. The Hol-ee Roller X Extreme is more than a chew toy though. It features openings that allow for treats to be placed inside, adding an extra element of challenge to playtime, something that can never be considered anything but a plus. 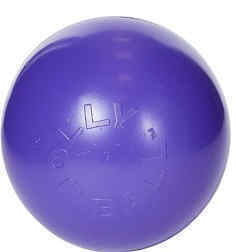 The first thing you'll notice about the Rogz Grinz Treat Ball is how much fun it looks. 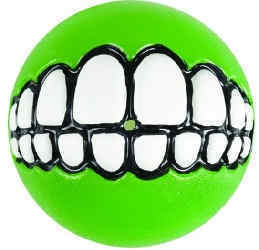 It's available in several very bright neon colors and features a big grinning set of teeth on the front. Within that set of teeth however lies a secret, a treat hole from which goodies will be dispensed if the pup pushes and prods the ball the right way. In addition to being a great and very engaging treat toy the ball can be used for the standard purposes a dog likes to chase a ball - a great game of fetch or an active game of doggie soccer - as it is durable and tough but also offers a good amount of bounce. Not only do those who purchased this toy find it amusing - especially when their pup can position the 'teeth' just right, but also report that their pups remain very interested in the ball for long periods of time, making it a good option for helping to relieve separation anxiety when their pet parents are away. Just like any other pup most Dobermans like a 'friend' to curl up with and cuddle when it's time for some downtime and sleep. The problem that most Dobie pet parents face however is that their pups 'love' their cuddly toy a little too much and it is often just a matter of a few hours before there is nothing but torn material and a lot of loose stuffing to clean up. Crazy Critters are stuffing free, so that is a problem that this cute racoon toy immediately solves. In addition it is crafted from a very durable fabric that a number of reviewers remark that they were very surprised that their aggressive chewer Dobies did not manage to destroy. There is also a squeaker, so that adds an extra element of fun to the toy. These cuddly toys are also an excellent choice for puppies as not only do they benefit greatly from having great toys to play with but the fluffy nature of the 'fur' makes it a great friend to curl up with and cuddle, something most puppies still need and very much enjoy. All of the toys on this list are great choices but there are, of course, many more out there. When shopping for the best dog toys for Dobermans in general the more durable it is the better. Many standard toys are just not built to withstand the chewing and ripping 'prowess' that most Dobermans possess and so trying to find a toy that is 'built to last' is a must. Intellectual stimulation capability is another great attribute for a Doberman toy to have. This is a notoriously intelligent breed and they can become bored very easily, especially when left alone and that boredom can turn into destruction. A great puzzle toy can go a long way towards solving that problem. What Toys Should Not Be Given to a Doberman? There are some dog toys that are simply not suitable for the vast majority of Dobermans. Anything that is in anyway flimsy is out for a number of reasons. The first, obviously, is that the toy will be far too easy for them to destroy and you will basically have wasted your cash. The second is a little more serious, as a broken or ripped toy can sometimes present a serious choking hazard. This is especially true if the toy contains a squeaker, as some of them are sized so that were a Dobie to get at it, it may become lodged in their windpipe, something that is a scary scenario for any pet parent.